Gdansk, located in northern Poland, is a city that thrives on its connection to the sea. In Gdansk, you'll see a giant medieval harbor crane, a monument to fallen shipyard workers, and plenty of amber - which, of course, washes up on Gdansk's beaches. 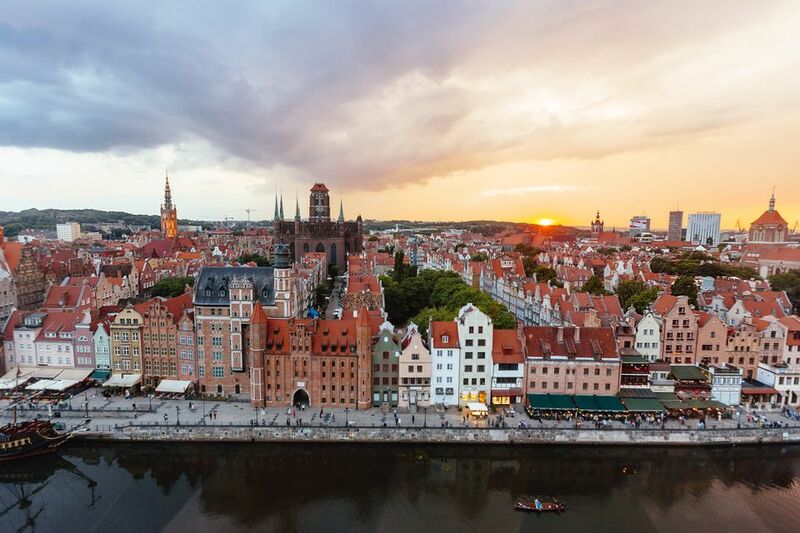 Enjoy a panorama of this Polish city from the top of St. Mary's Church, pass through Gdansk's famous gates, and visit some of its best museums, too. After you pass through the Green Gate at the end of Long Street, you will find yourself on the bank of the Motlawa River. The view from the bridge gives you your first impression of life on Gdansk's riverfront, but the medieval harbor crane immediately draws your eye. Looming over the water, this structure is a testament to Gdansk's historic relationship with the sea. The crane was built in 1444, which makes it Europe's oldest crane. If you walk under the crane, you can view its inner workings with its massive rope and gears. Walk along the banks of the Motlawa river to find charming seafood restaurants, amber and crystal vendors, shops carrying nautical products, floating cafes, the maritime museum, and historic sea-faring vessels. Called either the High Gate or the Upland Gate, this silvery-gray brick facade marks the beginning of Gdansk's so-called Royal Route, through which the king would pass on his visits to the city. This 16th-century gate was originally a part of Gdansk's defensive system, but it now stands as an isolated structure. The bricks are unusual in that they bear a leaf-like pattern, and overhead, you'll see the crests of Gdansk, Poland, and Prussia. Long Street is called "Dluga" on Polish-language maps, and this is where you will see the bulk of Gdansk's Main Town sights. Long Street is the cultural and historical heart of Main Town, where you will find many museums, works of architecture, cafes, shops, and photo opportunities. Main Town Hall can be seen on any walk through Long Street, as well as from the tower of St. Mary's Church. The reconstructed medieval Main Town Hall of Gdansk is now a history museum. Visit it to gain perspective on Gdansk's long and interesting history through exhibits that include weapons, art, and historic artifacts. St. Mary's Church is the largest brick church in the world, and a climb to the roof offers unparalleled panoramas of Gdansk. Before you hike up the 400-plus stairs to reach the top tower, however, take a moment to enjoy the cool atmosphere of the church interior. Here you'll see relics from the past, including a wooden pieta, a 500-year-old astronomical clock, and a three-dimensional tryptic of the Last Judgement. The Royal Chapel of St. Mary's Church was built by King Jan III Sobieski in Baroque style. Its sherbert-colored face with ivory columns stands out in surprising contrast to the dark brick of the church itself. The northern edge of Gdansk's Old Town is known for having made history as recently as the last century. The Gdansk Shipyards, formerly the Lenin Shipyards, was the location of a workers' uprising. Solidarnosc, or Solidarity, was the name chosen for the trade union formed by shipyard workers in Gdansk during the 1970s, which finally won governmental recognition despite severe persecution of its members. The workers' struggle is commemorated with a gigantic monument, as well as with smaller plaques placed around the courtyard outside the shipyard gates. The Great Mill is now a shopping center, but from 1350 to 1945, this mill was the largest working medieval mill in Europe. If you venture inside the Great Mill, you'll be able to see items found during excavations at the site. In its original form, the structure served as a flour mill, granary, and bakery, and the exterior still exhibits a working water wheel. Visit the Town Hall of the Old City for glimpses of 17th-century interiors and a visit to the Baltic Sea Culture Center. The Old Town Hall is a remnant of the past when the old town and main towns of Gdansk were separate entities. Both town halls were initially built during the 14th century; despite its name, Old Town is no older than Main Town.